I just tried Nolet's gin for the first time recently. It's produced in Schiedam in the Netherlands and the distillery was founded in 1691 by Joannes Nolet. The gin, while quite expensive, is extremely floral and fruity in nature and makes a lovely classic martini. The unique botanicals used in the gin are Turkish rose, peach, and raspberry. The Nolet's Silver Bramble is made with 1oz Nolet's Silver Dry Gin, 0.50oz fresh lemon juice, 0.25oz simple syrup that is stirred in an ice-filled rocks glass and topped with cassis liqueur, and garnished with a raspberry. 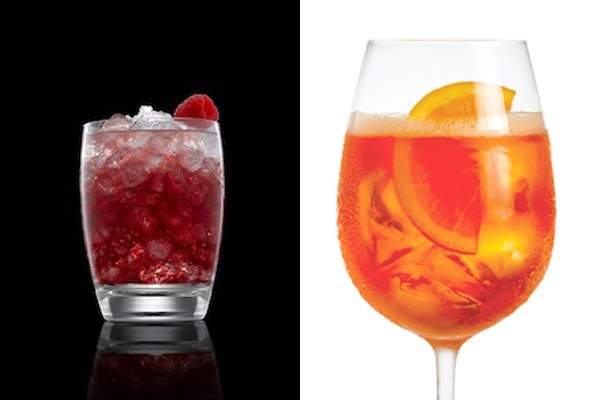 The Gaucho restaurants in England serve an aperitif called the Spritz Blanco which is an Argentinian aperol spritz made with Sauvignon Blanc / Torrontés wine, Aperol, fresh grapefruit juice, served in a large wine glass over ice and topped with Argentinian sparkling wine. It sounds like a light, refreshing way to end an afternoon in the sun or start an evening. I would garnish with a slice of orange or grapefruit.